This article is about the Oregon county. For other uses of the word "Malheur", see Malheur. Malheur County is included in the Micropolitan Statistical Area, which is also included in the Boise Combined Statistical Area. It is included in the eight-county definition of Eastern Oregon. According to the U.S. Census Bureau, the county has a total area of 9,930 square miles (25,700 km2), of which 9,888 square miles (25,610 km2) is land and 42 square miles (110 km2) (0.4%) is water. 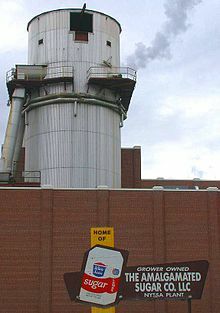 It is the second-largest county in Oregon by area and the only county in Oregon in the Mountain Time Zone. Malheur County is one of the few counties in the United States with two time zones. Most of the county is in the Mountain Time Zone, but a small portion in the south is in the Pacific Time Zone. In the county, the population was spread out with 27.60% under the age of 18, 10.60% from 18 to 24, 27.20% from 25 to 44, 21.00% from 45 to 64, and 13.70% who were 65 years of age or older. The median age was 34 years. For every 100 females, there were 116.00 males. For every 100 females age 18 and over, there were 121.20 males. Malheur County is one of the most Republican counties in Oregon when it comes to Presidential elections. It was one of only two counties in Oregon to give the majority of its vote to Barry Goldwater and has favored the Republican candidate for decades. The last Democratic candidate to carry the county was Franklin D. Roosevelt in 1940. Further every Republican candidate since 1996 has received more than 60% of the county's vote. 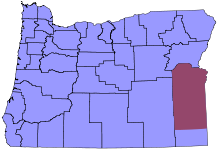 Malheur County is also one of the most reliably Republican counties in state elections, for example in the 1998 gubernatorial election it was the only county to vote for Bill Sizemore instead of John Kitzhaber, and in the 2004 U.S. Senate election, it was one of only three to vote for rancher Al King over Ron Wyden. As part of Oregon's 2nd congressional district it has been represented by Republican Greg Walden since 1999. At the state level, Malheur County is within Oregon's 30th Senate district, represented by Republican Cliff Bentz. In the Oregon House of Representatives 60th district it is represented by Republican Lynn Findley. ^ a b "State & County QuickFacts". United States Census Bureau. Archived from the original on July 14, 2011. Retrieved November 15, 2013. ^ "malheur - traduction - Dictionnaire Français-Anglais WordReference.com". www.wordreference.com (in French). Retrieved 2018-04-11. ^ a b Jacklet, Ben (April 2008). "Prisontown myth". Oregon Business magazine. Archived from the original on 2008-12-02. Retrieved 2008-03-25. Wikimedia Commons has media related to Malheur County, Oregon.